Portland Maine's Old Port - a perfect place for the urban chic wedding photographer to create some magical images. 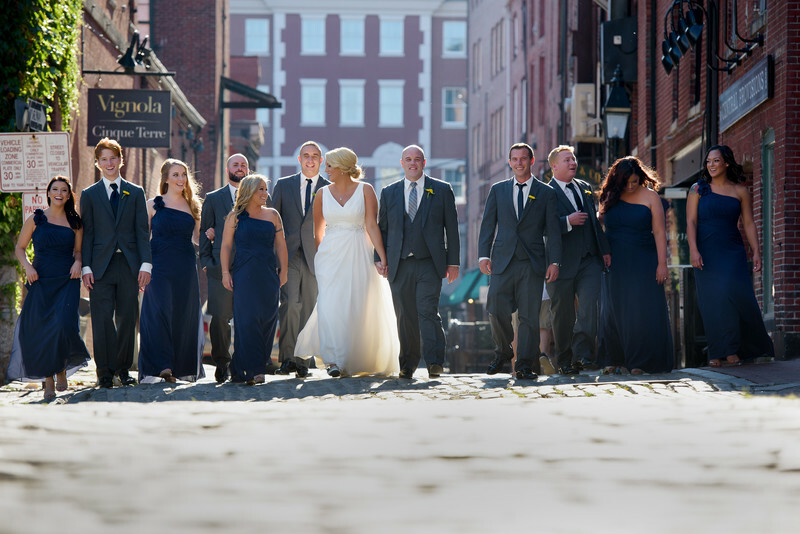 In this image our bride and groom along with the entire wedding party enjoy the moment walking in Portland's famous Wharf Street. We just finished up a sweet first look on Dana Street where Connor had his back turned and his bride presented himself. The excitement was in the air as soon the wedding party was off to Fort Allen park for the wedding ceremony. The Old Port area in Portland offers wonderful variety for wedding photographs to be taken. The old cobble stone roads, red brick, black iron accents and other antiquities contrast nicely with the chic fashion of our wedding party making for some lovely images. As a Maine wedding photographer based in Cape Elizabeth I am familiar with all the best locations in the area. Location: Wharf Street, Portland, Maine.